Description: Has a yellow or white dorsum and an orange (sometimes yellow) overlaying color pattern. The wing markings [which can be moderately thick] are all disconnected, with the pattern not extending uninterrupted from one wing to the other [when the wings are closed]. There is a dark line on the costal margins of the wing, and four black spots near the rear of the wing (if the wing is closed, only "3" spots may be visible; 2 of the spots are on the wing tip). The top of the head has parallel orange lines, which extend onto the pronotum, forming a Y-shaped mark; the sides of the pronotum have a bold orange bar. The scutellum has three orange triangles- two large ones in the upper corners, and one in the bottom. 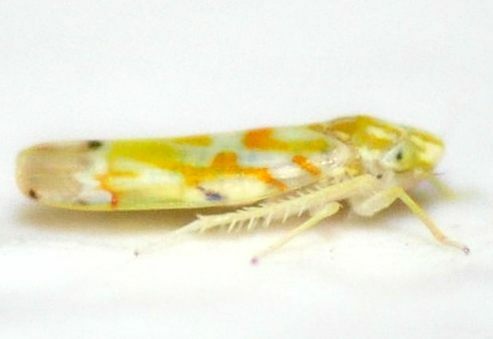 Adults are probably between 2.8 and 3.2 mm long. Abundance: Recorded from the Piedmont, probably more abundant in the right habitat. Habitats: Mixed hardwood forests, open forests, etc. Plant Associates: See respective species pages, but usually Vitis sp. (grape). Comment: This page serves as an umbrella for any individuals of Erythroneura that do not have interconnected orange wing markings. In the eastern and central regions of North America, there are a number of Erythroneura species that have very similar wing patterns, so similar that it is unlikely a reliable identification can be made between these species without dissecting an individual and looking at genitalia. Below are the Erythroneura species that are encompassed by this page, with text taken from Dmitriev & Dietrich, 2007 illustrating the descriptions of color and pattern for each species. Links exist for the profile page of each species. E. browni- Dorsum yellow or white. Color pattern red or orange. Vertex with orange parallel submedial lines (often with lateral branch). Vertex midline pale. Anteclypeus pale, concolorous with rest of face. Pronotum with Y- or V-shaped medial vitta. Mesonotum entirely pale, apex concolorous with rest of mesonotum. Thoracic venter entirely pale. Forewings with broken oblique vittae, without crossbands. Clavus with separate basal and distal vittae. Forewings with dark spot on costal margin. Forewing apical cell II with distal spot, inner apical cell with brown spot basally. E. comes- Dorsum yellow or white. Color pattern red or orange. Vertex with orange parallel submedial lines (often with lateral branch). Vertex midline pale. Anteclypeus pale, concolorous with rest of face. Pronotum with Y- or V-shaped medial vitta. 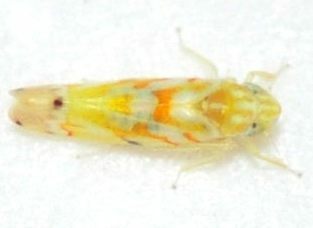 Mesonotum entirely pale, apex concolorous with rest of mesonotum. Thoracic venter entirely pale. Forewings with broken oblique vittae, without crossbands. Clavus with separate basal and distal vittae. Forewings with dark spot on costal margin. Forewing apical cell II with distal spot, inner apical cell with brown spot basally. For images of dissected individuals of this species, see here. E. omaska- Dorsum yellow or white. Color pattern red or orange. Vertex with orange parallel submedial lines (often with lateral branch). Vertex midline pale. Anteclypeus pale, concolorous with rest of face. Pronotum with Y- or V-shaped medial vitta. Mesonotum pale, with dark lateral triangles, apex dark, contrasting with adjacent pale areas. Thoracic venter with dark mesosternum, remainder pale. Forewings with broken oblique vittae, without crossbands. Clavus with separate basal and distal vittae. Forewings with dark spot on costal margin. Forewing apical cell II with distal spot, inner apical cell with brown spot basally. E. ortha- Dorsum yellow or white. Color pattern red or orange. Vertex with orange parallel submedial lines (often with lateral branch). Vertex midline pale. Anteclypeus pale, concolorous with rest of face. Pronotum with Y- or V-shaped medial vitta. Mesonotum entirely pale, apex concolorous with rest of mesonotum. Thoracic venter entirely pale. Forewings with broken oblique vittae, without crossbands. Clavus with separate basal and distal vittae. Forewings with dark spot on costal margin. Forewing apical cell II with distal spot, inner apical cell with brown spot basally. E. vaga- Dorsum yellow or white. Color pattern red or orange. Vertex with orange parallel submedial lines (often with lateral branch). Vertex midline pale. Anteclypeus pale, concolorous with rest of face. Pronotum with Y- or V-shaped medial vitta. Mesonotum entirely pale, apex concolorous with rest of mesonotum. Thoracic venter entirely pale. Forewings with broken oblique vittae, without crossbands. Clavus with separate basal and distal vittae. Forewings with dark spot on costal margin. Forewing apical cell II with distal spot, inner apical cell with brown spot basally. For images of dissected individuals of this species, see here.